I love lemons. Others may love chocolate or more exotic choices, but my heart belongs to the bright acidic flavour and smell of lemons. Call me boring or call me unadventurous, but I will take lemon curd over chocolate mousse any day of the week. 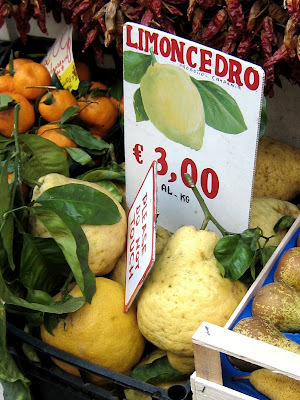 Our visit to Sorrento and the Amalfi Coast was instant immersion into the land of lemons. Small lemons, big lemons, smooth lemons, bumpy lemons, and lemons as big as my head called limoncedro were sold in every town and citrus trees grew everywhere. 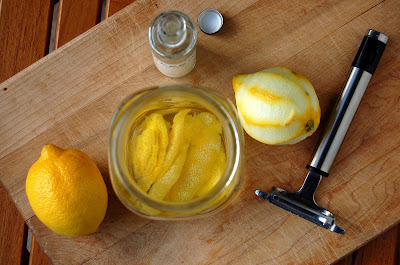 To my understanding, limoncedro are used mainly for candied peel whereas regular limone are typical multi-purpose lemons, used for juice and zest as well as in the production of limoncello, a lemon liqueur which is the Sorrentine Peninsula's most famous product. Oddly, I did not purchase any limoncello while in Sorrento for fear of breakage in transit and instead, was determined to make my own upon return having seen the simple process on the Food Network years ago. Certain recipes use vodka (40 to 50% alcohol) while others prefer up to 95% alcohol for maximal extraction of lemon oil. My liver and I opted for vodka instead of pure ethanol and as fate would have it, I received two free little bottles of EFFEN vodka (say it out loud, yes, it is pure marketing genius) in a gift bag from a certain awards ceremony I recently attended. By simply combining vodka and lemon zest (no pith please) and waiting for a week, a beautiful golden hue was lent to the vodka and the aroma was intoxicating. After removing the zest, simple syrup was added and my limoncello was done. Had I steeped the zest even longer than a week, the lemon flavour could have been even more intense but I wanted to use my liqueur right away. After four months of gathering dust, the cookbook Indulge: 100 Perfect Desserts by Claire Clark from The French Laundry, was given the attention it deserved. This cookbook is well-organized; the ingredients are presented by weight thankfully and the methods are descriptive and detailed, appropriate for serious amateurs and pastry professionals alike. I found a use for my limoncello in the "adult lemon trifle" recipe, an opportunity to use up some leftover lemon curd and yellow cake which was hibernating in the freezer. The lemon curd was sandwiched between thin layers of yellow cake, which was then cubed and drenched in my homemade limoncello. Lemon posset was poured over the soaked cubes and topped with homemade amaretti crumbs and whipped cream. I had never heard of possets previously but this silky mix of lemon juice, sugar, and hot cream is so easy to make that it is almost embarassing. 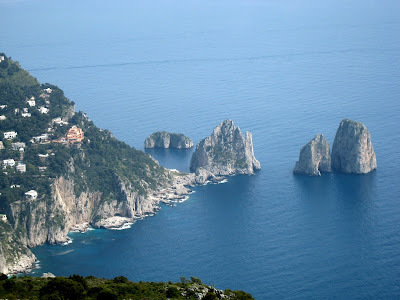 Having about 200 millilitres of limoncello left, we will have opportunities to reminisce about the lemons of the Amalfi Coast in the weeks to come. Besides eating my way through Pierre Hermé's showcase, I did venture to other eateries in Paris in search of novel eye-catching items such as Sadaharu Aoki's bon bons maquillages, a rainbow assortment of enrobed ganache sticks. Flavours included yuzu, matcha, wasabi, and black sesame in addition to more traditional fare. Having been obsessed with rainbows as a child, my first impulse was to buy every flavour so that I could arrange them in the correct prismatic order, but I controlled myself and instead, purchased several pre-packaged boxes. 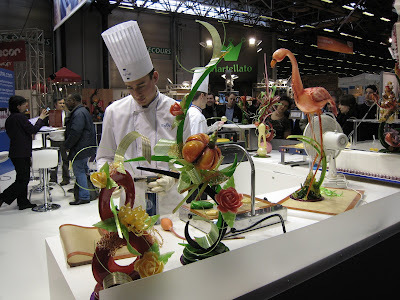 The main reason for visiting Paris this year was to attend Europain 2008, a massive trade show featuring 644 exhibitors representing the baking, pastry, chocolate, confectionary, and ice cream making industries. La Coupe du Monde de la Boulangerie and Le Mondial des Arts Sucrés competitions were also held concurrently at this event. 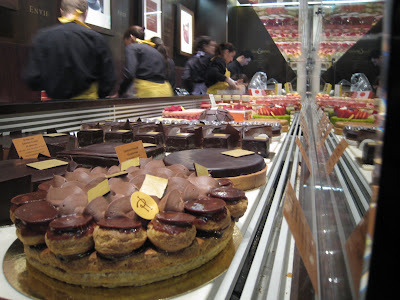 As a relative neophyte in the world of artisan pâtisserie, the experience was overwhelming due to the sheer size (80,000 sq. 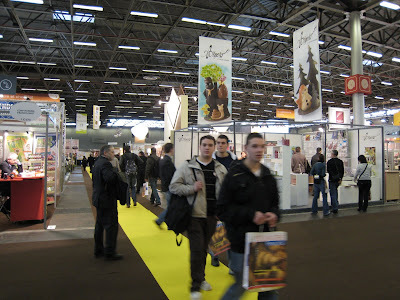 metres of exhibition space) and scope of Europain. Because I do not own my own pastry shop or bread factory and happen to be Canadian, not European, the majority of exhibits were irrelevant to me from a commercial standpoint; however, seeing the range of innovative products and technology available to the smallest artisanal pâtissier all the way to the largest industrial bread producer was fascinating. I will know where to come whenever I am in the market for a mixer large enough to fit six people with two whisk attachments that are each taller than me. Only some exhibitors were actually selling items direct to visitors, mainly half-price Easter chocolate molds, Flexipans sheets, and colourings. To my amazement, my attention was drawn more towards breads and Viennoiserie because of how refined, beautiful, and diverse these yeasty products could be. 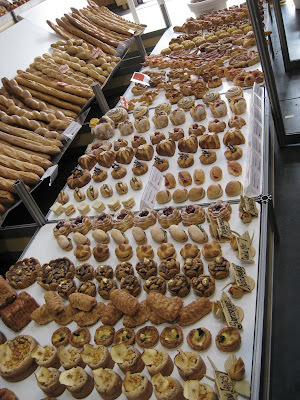 Baguettes may have outnumbered humans at Europain but the other creations from the simple origins of flour, yeast, and water were most impressive, making my jaw drop on multiple occasions in wonder and awe. My favourite two things at Europain were two dresses, one constructed from Flexipan bakeware and the other from bread. 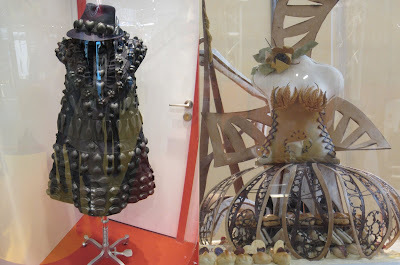 Complete with fedora, the little black silicon dress would be useful in any sticky social situation whereas the yeasty couture creation, France's bread showpiece for La Coupe du Monde de la Boulangerie, is a feast for the eyes and stomach. Speaking of fashion, Milan proved to be a formidable destination for the couture-challenged person that I am today. Every Milanese woman was dressed right off the runway, complete with the big trophy purse and 4 inch stilettos. I, on the other hand, dressed in comfort flats and the chicest travel clothes I possessed, was more appropriately suited for window shopping and frequenting a renowned gourmet store, Peck Deli, which was steps away from our hotel. The Peck community also includes a lunch bar and the very upscale Michelin two-star Cracco Peck restaurant. 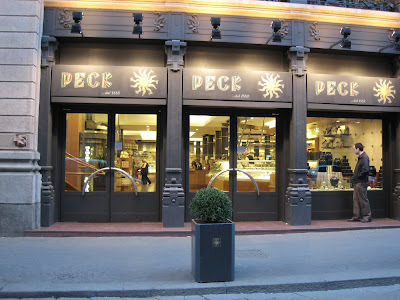 I could have spent many euros at Peck Deli but not having my own kitchen in Milan nor sufficient gastrointestinal capacity limited me from indulging in the many tantalizing terrines, pastas, salads, meats etc. The singular item which I fancied the most was a union of two things which I hold dearest to my epicurean heart, the macaron and gelato. There were small and large gelato-filled macarons as well as piped gelato roses on nougatine bases. I chose the large chocolate macaron with chocolate gelato and was impressed with how it was packed on dry ice within its own styrofoam box. In my haste to consume my hybrid dessert, I did not let it thaw enough and consequently, the macaron was not as soft as desired. Regardless, just when I thought macarons could not get any better, they do! 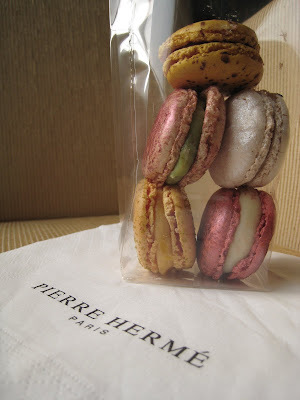 The first and last place I visited in Paris was Pierre Hermé. In fact, over the four days we spent in Paris, four visits were made, once to the rue Vaugirard boutique and thrice to the flagship rue Bonaparte boutique which was merely a short five minute walk from our hotel (not a coincidence). 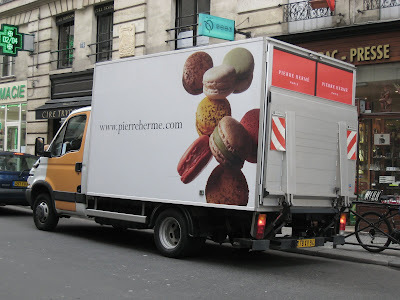 Unlike our 2007 visit, I streamlined my pâtisserie exploration to just six locations and concentrated the majority of my sucrose exposure to just 5 pastries and 17 macarons from Pierre Hermé, all shared equally with Eric, of course. We even had to wait patiently in queue this year on two occasions but the anticipation made it even more satisfying. There is an air of formality in the boutique, as customers shuffle along, intently inspecting their choices, ooing, aahing and pointing, while the staff are bustling efficiently to help you. 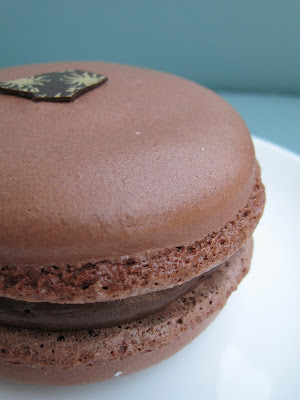 Larger entremets come first, then the individual sizes, followed by the macarons, with Viennoiserie, confections, and chocolates along an opposite wall. Let me introduce to you the spectacular items which graced our tastebuds after intense dissection. Excuse me if I sound like I am gushing, but it is truly indescribable how magnificent the balance of flavours and textures and the execution of Pierre Hermé's creations are. 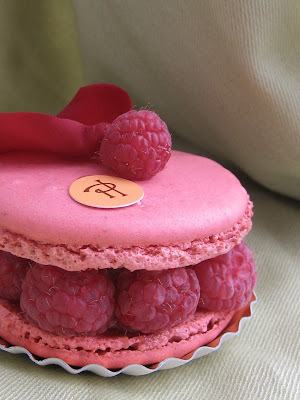 Ispahan. The classic, often copied, pink beauty which features the signature triumvirate of rose, raspberry, and lychee. Strangely delicious even though I do not actually like rose or lychee very much individually. So gorgeous to look at, it was slightly tragic to have to stick a fork into the pink exterior, but after one bite, we had no reservations and dove head first into the rose macaron, rose cream, raspberry and lychees. 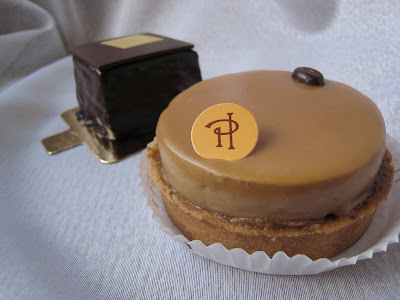 Plaisirs sucrés. This delicious marriage of milk chocolate and hazelnut is masterpiece which must be fun to assemble. 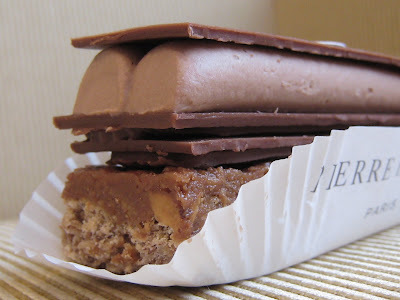 By stacking a chewy hazelnut dacquoise base with fine milk chocolate tiles, praliné feuilleté (mixture of hazelnut paste with crisp wafery flakes), ganache, and milk chocolate cream, the result is actually very light on the palate with a pleasurable crunch. Carrément Chocolat & Tarte au Café. The dark chocolate cube is minimalist in design but deceptively complex in texture, filled with the obligatory soft chocolate biscuit and rich mousse, but also fine shards of cocoa bean (much finer than cocoa nibs) for the most delicate crunch. A tart unlike no other, the coffee essence captured in this almost plain looking creation was unparalled. It was like drinking the best cup of espresso but in creamy ganache and chantilly form, finished with a buttery sandy pâte sablée crust and coffee fondant glaze. 2000 Feuilles. It's not an exaggeration. 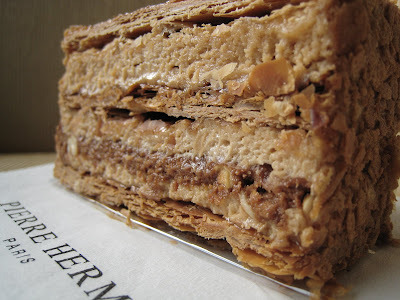 Millefeuille's big brother has the flakiest puff pastry, caramelized and buttery, sandwiched with hazelnut mousseline and praliné feuilleté. Anything between this puff pastry would be worth eating. I do not envy whoever has the job of cutting this fragile creation. Macarons. The best for last. Undeniably the best in Paris, in my humble opinion, bordering on ridiculous how delicately thin the outer crisp skin of the macaron is, without any hint of chewiness or excessive sweetness, just a soft flavour implosion. My favourite is a tie between Arabesque (apricot & pistachio) and Mogador (milk chocolate & passionfruit). I could have eaten 3 dozen in one sitting if given the chance but I did need to leave room for salt and protein in my diet.